The Real Estate Cafe is redesigning it's main web site and we'd like to invite our clients and others to comment on some DRAFT text. Would the following three keywords and positioning statements make you want to work with us rather than one of our competitors? As nationally recognized consumers advocates, The Real Estate Cafe has been pioneering new business models that help home buyers and sellers save billions of dollars for more than a decade. The Real Estate Cafe partners with it's do-it-yourself, tech savvy clients and rewards them with unrivaled commission rebates. You can also pay for our services "a la carte" on an hourly and flat fee. 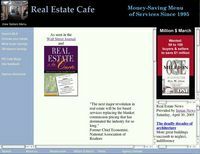 Knowledge is power and The Real Estate Cafe teaches its clients how to "beat the system" through educational seminars, blogs on important topics like the real estate bubble, and peer-to-peer communication through it's unique "Tipping Policy" where we PAY YOU for your opinion! Over the past decade, The Real Estate Cafe has had the privilege of working with some extraordinary home buyers and sellers who are not afraid of doing parts of their own real estate transactions, and who do extraordinary things in their own personal and professional lives, too. To launch our new "FSBOs on Steriods" seminars and to celebrate our 10th anniversary, we will profile a number of past "do-it-yourself" clients through a series of "Do'ers profiles." Some of our baby boomer clients and blog readers will remember the original "Dewar's profiles" from the 1970's, or it's recent revival. The Real Estate Cafe's current and past clients are notable, too: one recent Cambridge client is building a "do-it-yourself" air craft in his garage, and another friend is one of the nation's leading advocates for "do-it-yourself" funerals. What's the "do-it-yourself" movement got to do with real estate? That story will unfold in subsequent blog postings. Stay tuned to learn how you can save thousands of dollars in your own real estate transactions by doing some of the work yourself, and hiring professional help "a la carte" from The Real Estate Cafe's menu of services. If you are thinking of selling your own home, visit our step-by-step guide online or attend one of our upcoming seminars to learn how you can save money and save lives by "doing-it-yourself."